Whilst it may feel safe from the flood waters swamping the North of UK at the moment, floor 12 in the Hilton Leeds may not seem so great when the lifts are out of service! Armed with the Fitbit Ultra though I thought it would make good research whilst I'm still checking the numbers and statistics. I hit the start button at the ground floor and headed up. 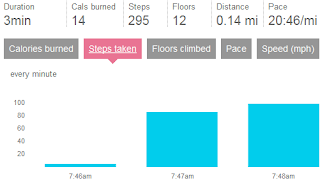 Here's the results - clever how it knows the number of floors.